A GREEN BREAKFAST. LOVING LOVAGE. I was reintroduced to lovage, a perrenial herb, on a recent trip to Sweden and was suddenly reminded of how much I have always loved it's pungent celery-like smell. In Northern Sweden I had a wild herb tea with breakfast at Faviken and it happened to have in it, among other things, lovage.This past Saturday at The Greenmarket, I passed a vendor selling some fresh lovage. I couldn't resist crushing the leaves a bit before I bought them because it smells that good! As I wandered around, I bought some eggs and some watermelon cucumbers from Windfall Farms. By the time I got home I was inspired. I had decided to make a breakfast of hard boiled eggs, melon cucumbers sprinkled with lovage salt and a fresh mint and lovage tea. A little wierd, I know, but it was all about the lovage. Tear the leaves off the stems of the lovage. The salt will start to turn a brilliant green as the leaves get crushed and combine with the salt. Keep crushing until ALL THE LEAVES ARE COMPLETELY DISINTEGRATED AND THE SALT CRUSHED TO A FINE PASTE. The salt will be a little wet this point. Preheat the oven at 250 degrees. As soon as it reaches temperature turn it off so it starts to cool. Scrape the salt out of the bowl and onto the parchment. Flatten the salt out with the backside of the spoon. Once you remove it from the oven, flatten it out once again with the back side of a spoon to separate all the salt crystals. Cool and place in an air tight jar. I like to use Weck or Le Parfait Super but a Ball jar with a lid will do just fine. 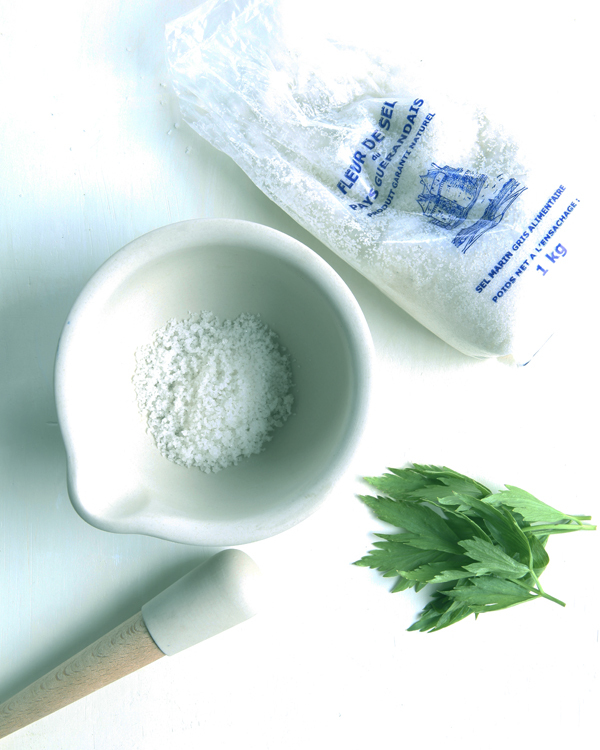 Lovage salt is very strong and has a lot of flavor, so use it sparingly. It was delicious on the cucumbers and the eggs. You can make a flavored salt with any herb it is the same process, just be sure to alays use organic pesticide free plants. I plan on doing a more in depth salt post when I can upstate and see what is in the garden! Tear a good hand full of fresh mint and lovage leaves place in your teapot and pour boiling water over the fresh leaves. 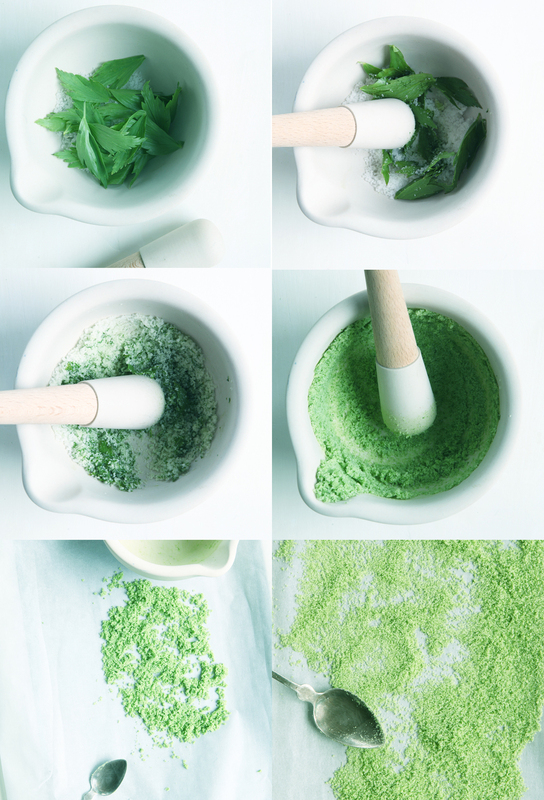 Your tea will be ready in jut a few moments after it has turned the palest of greens. Lovage tea is a great natural blood cleanser and really great for cleansing the kidneys, it also aids in digeston. It has when prepared this way the faintest taste of celery and is really quite nice when mixed with the fresh mint. I was surprised to find fresh lovage at the farmer's market. I was sort of resigned to the idea that I would have to grow it. We grew lovage in our garden when I was growing up, however we didn't use it too often in cooking We just liked the way it was so fragrant and easy to grow. Lovage plants are perrenial and can grow to be quite large. I am definitely adding it to my garden next year! Use Lovage anywhere you would use celery. lime and a healthy dash of lovage salt!